The Saint Paul Farmer's Market is located at 290 E. 5th St. in Lowertown. There is both a summer and winter farmer's market in Lowertown. During the spring/summer/fall, the market encompasses the entire block between E. 4th St. and 5th St. Besides produce, there is music, and activities for the kids. Although most of the market is outside in the summer there are also indoor activities in the Market House Collaborative where there will often times be additional vendors or music. Typically the summer market takes place on Saturdays from 6:00 AM - 1:00 PM and Sundays from 8:00 AM - 1:00 PM. During the winter market, several vendors such as meat, honey, soap, etc. will still setup in the same outdoor space. However, there is typically a more robust indoor presence, particularly in the Market House Collaborative. Typically the winter market takes place on Saturdays from 9:00 AM - 1:00 PM. The official Saint Paul Farmer's Market site has more details including dates, what's in season, recipes, etc. Some vendors do accept credit cards, however it is recommended to bring cash. It is in your best interest to bring cash to avoid ATM lines as there are currently only three ATMs in the area. One is right inside the front entrance of Black Dog Coffee and Wine Bar, The second is located inside Biergarten Germania. The third, is located in the Super America a few blocks north at 296 E. 7th St. EBT cards are also accepted. Parking a vehicle can be done in several locations in Lowertown which are noted on the parking page of this site. Additionally, public transportation including buses, Nice Ride bikes, and the light rail offer other options to reach the market. If you are looking for food ideas definitely follow Kathryn Fumie's blog FoodFumieAndYou. 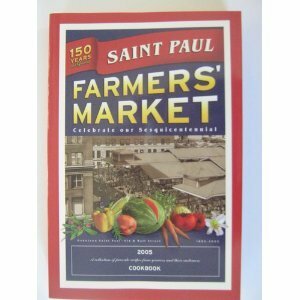 There is a great St. Paul Farmer's Market book with recipes that can also be at purchased on the Amazon website or at the Farmer's Market.